"Social Media is all glamour and glitz offering no real value", my friend teased me wickedly over a cup of coffee, fully aware of my high-caffeine interests in things social. I didn't respond. I smiled smugly, attempting to make peace with his premature judgment. Or so I thought. Little did I realize that it would start an intense journey of introspection, drilling through the neural mine of my innards for value deposits worth sharing. I paused. I could clearly see the reasons behind his dismissal. The tribe of Social Media gurus, ninjas, samurais are driving the social gold rush, sprouting all over like weeds, sucking the immediate hype value from the fertile soil.This tribe drives social as the proverbial hammer to which every problem ailing today's organization is the nail. Before you have understood the problem, voila! the solution is right there, defined in terms of collaboration and engagement, shouting and spitting loudly at your face. The tribe hasn't moved on from those heady days when Social Media was all about voluptuous statistics and Viva La Revolucion! As I introspected further, I realized that it was essential to address the elephant in the room : Social Media ROI. While there have been several pundits [for the lack of a better word] who have been addressing this question in earnest, I realized that there is lack of clarity in understanding the fundamental nature of social data. Here is a quick primer before we address the nagging question of Social Media ROI. With the advent of social graph, we are beginning to re-look at information differently, to put it mildly. With context coming to the fore for the first time ever, we are beginning to access its various dimensions [think of behavior, or, social flows]through stories, objects and narratives which derive knowledge and meaning. Context is the fulcrum here as it is up to us[and not content creators] to determine what worth we perceive of the information. 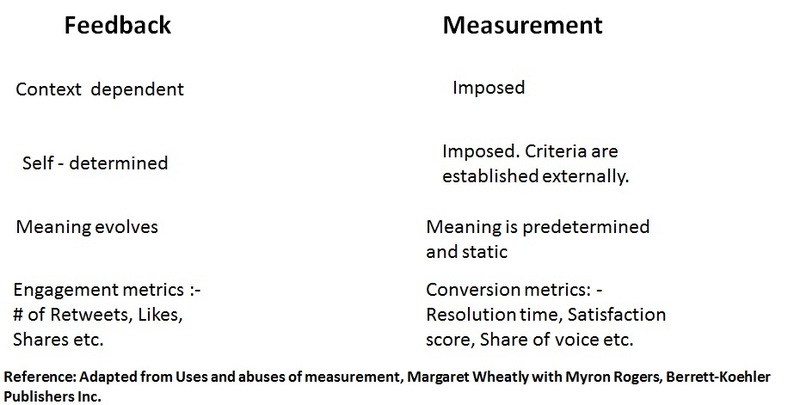 Given this high-level overview, I think it is essential to understand the difference between feedback and measurement. Several Social Media executives have often talked about the common tendency to confuse engagement metrics (likes, shares, retweets, impressions etc. )with ROI. The roots of this confusion arises from this misunderstanding. Social engagement metrics are feedback generated by the channels. This feedback is context-driven and changes regularly, depending on the state of engagement. Which brings us to the most abused word of our times: engagement. Vociferous critics have eloquently dismissed it fashionable, yet bankrupt. To which critics have retorted highlighting the much needed imperative towards reorganization rather than dissolution. Every new technology phrase, including engagement (and cloud) suffers from, what the wise sage Marshall Mcluhan called as, 'label-libel' gambit. Marshall Mcluhan points at the inscrutable human tendency to label an idea, cash it along the hype cycle, and libel it through a smoke screen which obscures its deeper workings. 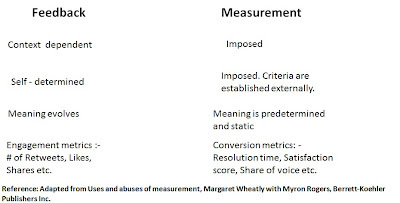 Engagement should be understood as an ongoing process, and not as an elusive goal.Social strategists are responsible to create measurement processes based on the feedback obtained by imposing the criterion based on business objectives. For instance, if our immediate concern is about cutting customer service costs incurred in call centers, we might want to focus on cost-per call or call-deflection based on Twitter feedback. Having set the context, I would be able to comfortably address the elephant in the room in my next post. Stay tuned!